Man always has been in progressive search for a platform, scenario and technologies to make reasonable and rational comparisons of the real Earth with a virtual Earth. During this quest, a lot of technologies have been deployed, it is obvious that making this quest a possibility, things will get easier for some establishments that are into environmental management, control and planning. City GML has long been one of the best approaches to this and it is not written off as this new technology comes onboard. 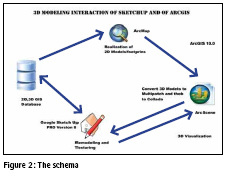 This paper focuses on the technology of combining ArcGIS and Google Sketch-up in creating not just Photorealistic models of the study area, but also 3D GIS that is functional and interactive. This paper gives a breakdown of the technologies applied in this project and how they were applied. Add the image of the study area into ArcMap: If the image has been georeferenced, you can start off your work immediately, but if not, Georeference it with ground control points obtained in the field. Create shapefiles for all the features you want to make use of in Arc Catalogue, and then add those shapefiles into ArcMap. Use the Editor tool to digitize the features thereby creating footprints of buildings, roads, trees and all other features. Create attributes in the attribute table for all the features in the layer so as to optimize querying. Add the footprints into ArcScene, and extrude it by a few meters. (Note: They will be of the same heights). Using the 3D Analyst tool in Arctool Box, Use the ‘Layer to 3D Feature Class’ tool to convert the layer to a multipath. Use the ‘Multipath to collada’ tool to convert to a collada file. Open the collada file in sketch up, click through any warning message. Right click and use explode tool to explode the model. Clear the box, yet, leave only the footprints. Use sketch up tools to redraw the foot prints to maintain perfect straight lines where necessary and perfect curves where necessary. Use the push/pull button to model to Architecture. “Sketch up version 5 (*.skp)”. In ArcScene, uncheck the box of layer for the extruded model and leave the only the layer 3D Feature Class. Use the select tool in the Editor tab to select the model you have re-modeled in Sketch up. Then In the 3D editor tab, select from the dropdown “replace with model”, then go the location you saved the Sketch up version 5 model and open it. You don’t have to reposition it. The advantage to this process is that it retains its geo-registration. 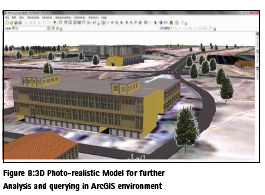 The combined technology of ArcGIS and Google Sketch up to produce 3D GIS and 3D modeling of a built environment have been shown in this paper to be a reliable approach of representing the real environment where analytics, real measurements and visualization can be made without fear of blown visible errors. Visualization methods successfully facilitate analysis in many science fields and have played a central role in communication of dependencies in spatial datasets. From the results of this project, different disciplines in environmental studies can key into this to enhance and upgrade their work. For example, an Urban and regional planner can actualize a neighborhood design, landscaping, layout designs etc. Having an integrated system of Photo realistic Models and Building Information Management, An Estate valuer can as well make use of this technique, since both the spatial and aspatial attibutes are maintained, He can actually, carry out His valuation without necessarily getting to the field. 3D modeling/3D GIS have been shown in this study to be a reliable approach representing the real environment using software applications such as those listed in the course of this work. The combined technology of ArcGIS and Google Sketch up to produce 3D GIS and 3D modeling of a built environment have been shown in this study to be a reliable approach of representing the real environment where analysis, real measurements and visualization can be made without fear of blown errors. Visualization methods successfully facilitate analysis in many science fields and have played a central role in communication of dependencies in spatial datasets. The approach used in this work presents a simple strategy that is suitable for required spatial applications. The procedure followed is economic based on available databases and can be implemented easily to deliver quick and sufficient results. An Estate developer needs this same technique in his profession. In situations where the client cannot go to the site due to some reasons, or that the site is very far away, this technique can be used to depict exactly what the client wants to buy. The advantages of 3D GIS (Modeling) cannot be over emphasized because of its applications in several disciplines. With respect to this work, an Urban Planner can use 3D GIS (Modeling) to present the prototype of what he has conceptualized. An urban Planner can as well produce a virtual city because if this technique was used in an environment like UNEC therefore, the technique can be used to create a virtual City e.g. Enugu City. Having an integrated system of Photo realistic Models and Building Information Management, an Estate valuer can as well make use of this technique, since the positions of a the feature maintained, He can carry His valuation without necessarily getting to the field. City GML is an advanced form of this work. In some developed countries, the effective use of City GML is being made use of . City GML actually has many applications -visualizing the City for various purposes (e.g. tourism, virtual tours), for urban Planning, in Navigation Systems, it is also used in intelligent Transportation Systems. It can be applied for noise modeling of large areas especially industrial sites / buildings. Pilouk M. (1996). 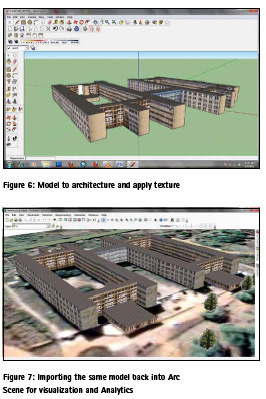 Integrated modelling for 3D GIS, Wageningen Agricultural University, The Netherlands. 200 pp. 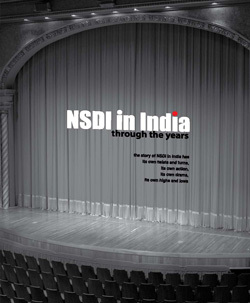 ISBN 90-6164-122-5. Iwaszczuk, D., Stilla U., 2010. Quality measure for textures extracted from airborne IR image sequences. International Archives of Photogrammetry, Remote Sensing and Spatial Information Sciences, vol. XXXVIII (part 3A), Saint-Mandé, France, pp. 79-84. Niem, W., Broszio, H., 1995. Mapping texture from multiple camera views onto 3D-object models for computer animation. Proceedings of the International Workshop on Stereoscopic and Three Dimensional Imaging, Santorini, Greece. Poulin, P., Ouimet M., Frasson M. C., 1998. 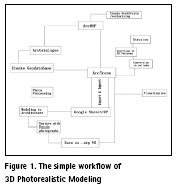 Interactively modelling with photogrammetry. Eurographics Workshop on Rendering, Springer-Verlag, pp. 93-104. The paper was presented at FIG Working Week 2017, Helsinki, Finland, May 29–June 2, 2017.